Keystone XL Pipeline Permit Issued By U.S. State Department : The Two-Way The move reverses former President Barack Obama's 2015 decision to reject the controversial pipeline. 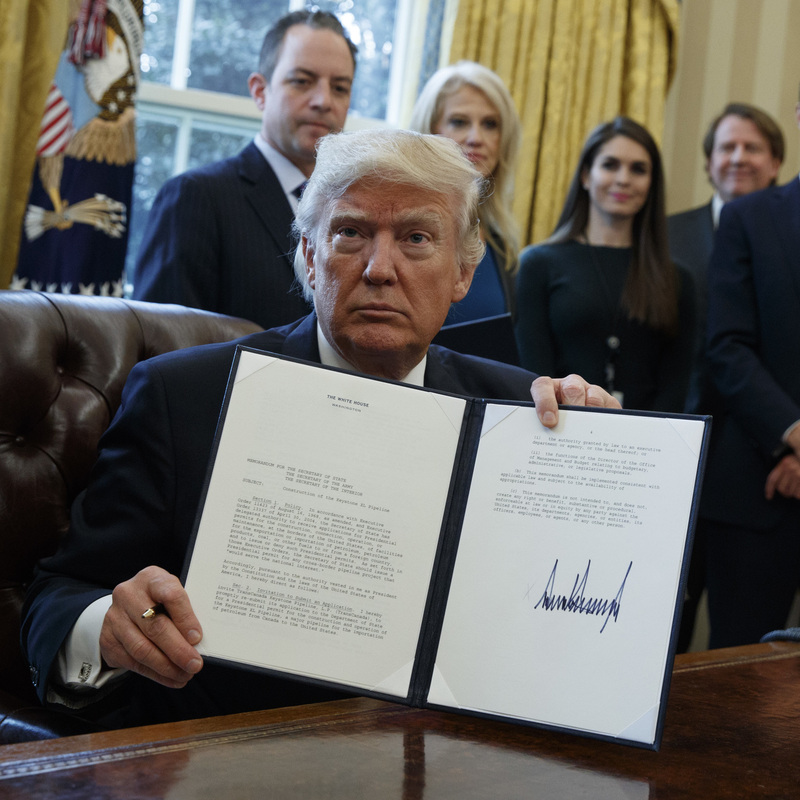 President Trump signed an executive order on Jan. 24 supporting construction of the Keystone XL pipeline. Pipeline company TransCanada says that in conjunction with the Trump administration signing off on its pipeline, it will drop a claim for more than $15 billion that it filed under the North American Free Trade Agreement. The company also says it will drop a lawsuit that claimed Obama's decision was unconstitutional. "We greatly appreciate President Trump's Administration for reviewing and approving this important initiative and we look forward to working with them as we continue to invest in and strengthen North America's energy infrastructure," said Russ Girling, TransCanada president and CEO. Four days after Trump was sworn into office, he invited TransCanada to resubmit its application for the pipeline. The president also directed the State Department to determine within 60 days whether the pipeline is in the national interest. Praising the pipeline on Friday as the "greatest technology known to man or woman," Trump touted the reversal as the first of many energy and infrastructure projects his administration plans to spearhead. "This announcement is part of a new era of American energy policy that will lower costs for American families and very significantly reduce our dependence on foreign oil and create thousands of jobs right here in America, " the president said in remarks from the Oval Office. A State Department spokesman says Secretary of State Rex Tillerson recused himself from that review process. Tillerson was CEO of Exxon Mobil, which has supported construction of the pipeline. Undersecretary for Political Affairs Thomas A. Shannon Jr. signed the determination. The proposed pipeline is controversial because of the oil it would transport. It's designed to move crude from Canada's oil sands in Alberta south to the U.S. Gulf Coast, where it could be refined or exported. Environmentalists oppose oil sands because producing it requires additional processing that emits more pollution. "The same communities who defeated this pipeline before — indigenous leaders, landowners, farmers and grass-roots activists — are ready to fight again," says 350.org Executive Director May Boeve. That fight is expected to take place in states the pipeline would travel through, especially in Nebraska, where some landowners and environmentalists have led a years-long legal battle to stop the pipeline. The oil industry and some labor unions have supported the pipeline, largely for the thousands of construction jobs it would provide. But those jobs are temporary. The State Department has estimated that once built, the pipeline will employ about 35 people.